I've been making my own Tomato Sauce for years. Coming from an Italian family, it'd be a crime to pick up a jar of prepared sauce from the grocery store and adorn your pasta with it. So as to avoid any Godfather-esque calamities, I've always made my sauce from scratch. Up until recently, I've used canned tomatoes. Partially because this is how my mom always did it, and my mom taught me to make sauce. Also, I've never had access to super fresh tomatoes that made it worth working with the non-canned variety. Mostly, if I am honest, I was intimidated by whatever procedure I had to perform to ready the tomatoes for sauce. So I always resorted to cans. I went to the West Chester Grower's Market last weekend, and the bounty of beautiful and plump tomatoes was too hard to resist. I decided then and there that I was going to buy a bunch and make my own sauce from scratch. From FOR REAL scratch. 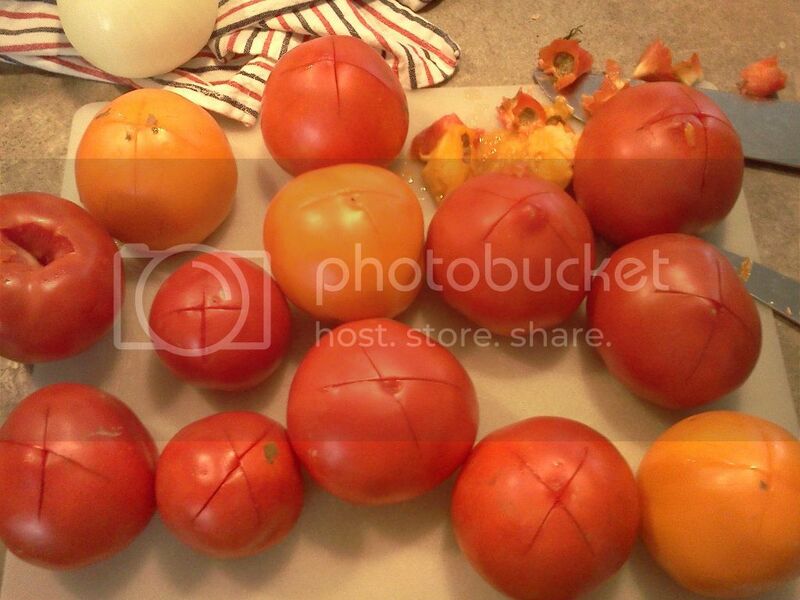 After hauling my Market Stash home, I took to the interwebs to learn how to prepare tomatoes for sauce. I posed the question on Facebook, and many people said they just blend the tomatoes, skins and all, in a food processor then run it through a mill so the skin was well incorporated. I don't have a mill, and I wanted to not deal with skins. So my next option was blanching. Blanching seemed difficult, but it was actually a quick and easy process. Since many of you might be wondering how to perform this step in the journey to make your own sauce, I documented each step. Just follow the instructions below, and you'll have (non-canned) whole peeled tomatoes in no time! Step 1: Fill a large stock pot with water and bring it to a boil over a high heat. Nearby, fill a large pot or bowl with ice water. Step 2: Dig out the top portion of the stem of each tomato and lightly score the bottom of the tomato with a knife. 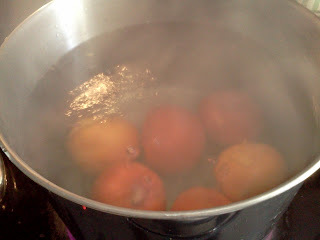 Step 3: In small batch, stick several tomatoes into the boiling water for 20-60 seconds. 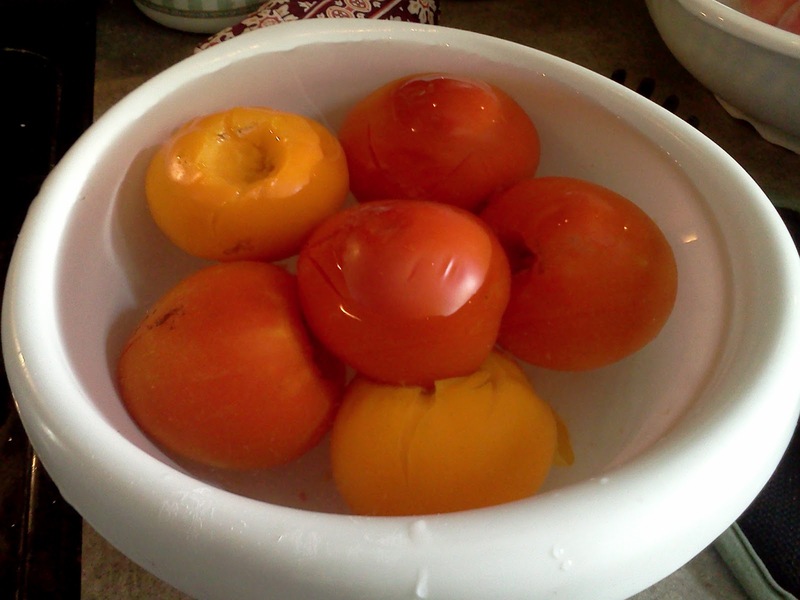 Step 4: When they are ready to be removed, take the tomatoes from the boiling water and immediately place them in the ice water. 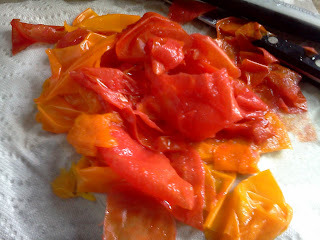 Step 5: When cool to the touch (it should be less than a minute), gently peel the skin away from the meat of the tomato. It should come off easily! 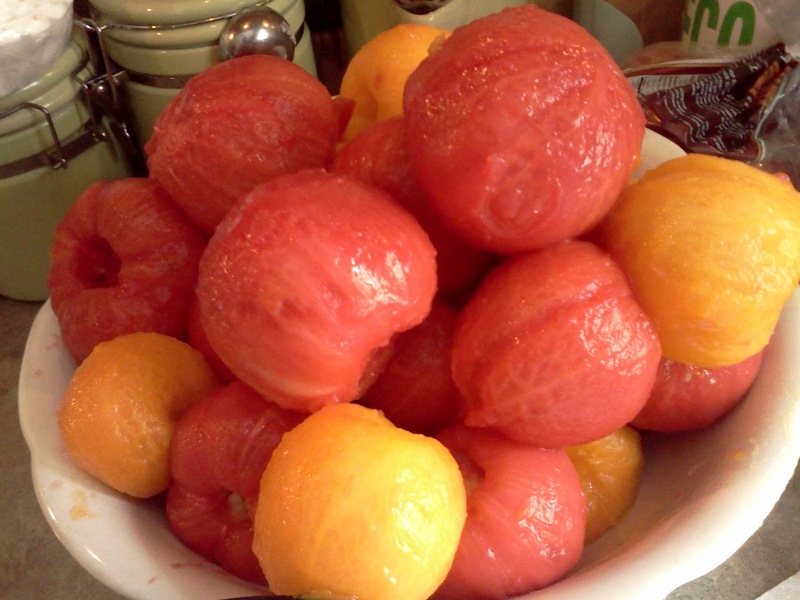 Step 6: Repeat until all of your tomatoes are skinned! 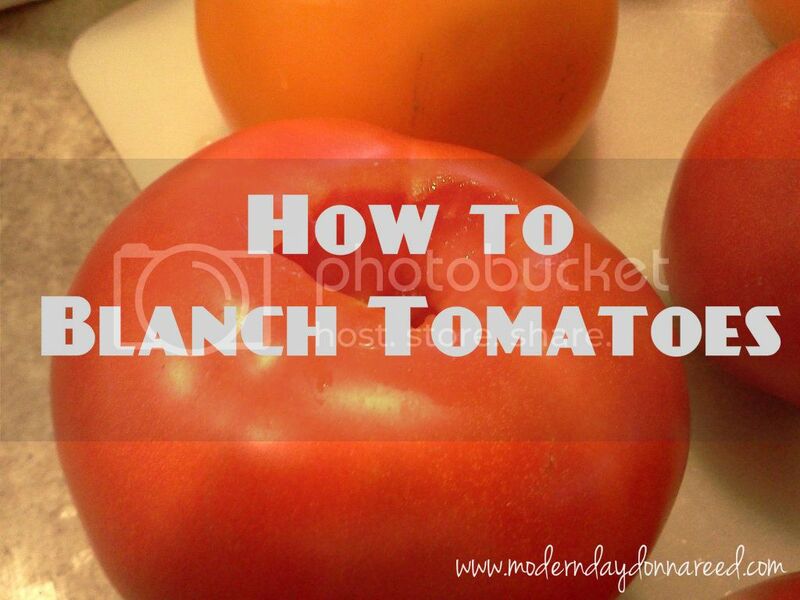 Will you be trying this blanching process anytime soon? 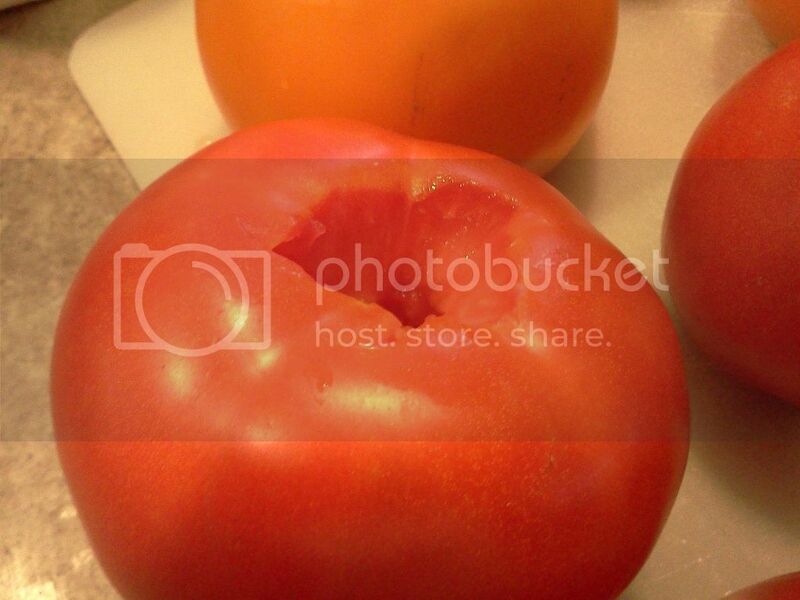 What will you be using the tomatoes for? say sadly for the reason that two usually are not linked, and public policy discussion isn't better.